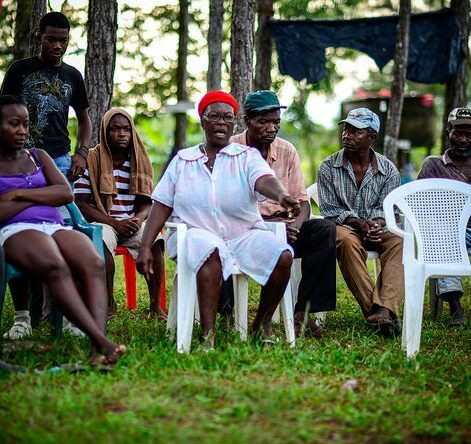 Vallecito: Vision of a Garifuna Future of Autonomy, Agri- and Aqua-Culture & Good Living! Live interpretation from Spanish by Stephen Bartlett. 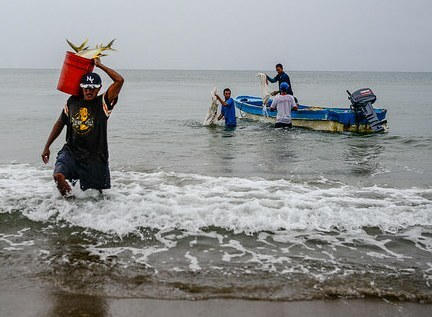 There is a complicated and challenging correlation of political forces impacting the Garifuna struggle, including the blow to democratic process of the 2009 Coup D’Etat and illegitimately and fraudulently elected coup-successor regimes, the extreme wealth and power of a tiny Honduran elite, the U.S. government support for this elite and its police and military forces, as well as deepening neoliberal policies and deregulation applied across Honduras. There is also the reality and threat of more out-migration of Garifuna from rural communities and villages to cities, including the humanitarian immigrant crisis of Hondurans fleeing to the United States. Yet with all that, the vision for the Garifuna leaders keeps coming into focus, clearer and clearer. Miriam Miranda, longtime organizer and current president of OFRANEH (National Fraternal Black Organization of Honduras) together with veteran leaders such as Alfredo Lopez, and young leaders such as Nahun Lalin, provided us with a look at those forces within a trajectory of struggle that has been happening through the efforts of OFRANEH since the 1980s. 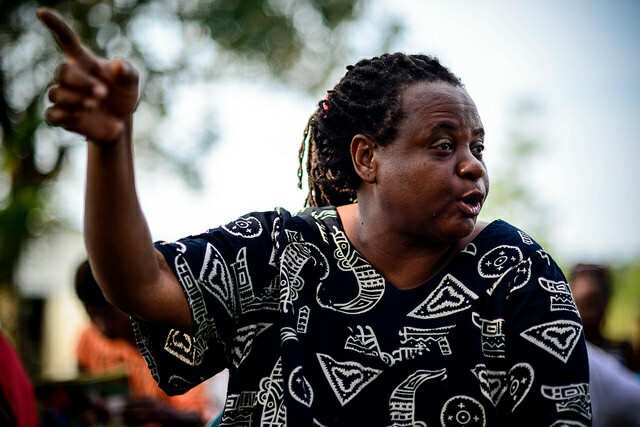 The Garifuna struggle in Defense of Ancestral Lands: Resisting Land Grabs, Using International Human Rights Law and Strengthening Autonomy through Cultural Renewal and Self-sufficiency. “Miguel Facussé Barjum is one of them (that wants all this land). Look where his land lies. It starts in Limon and comes all the way up here. 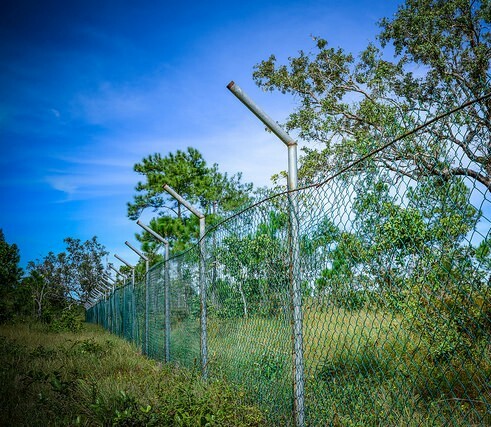 You’ve seen the fence that goes for miles and miles and miles. And he is on the other side too. It is a hard job, acompaniment to recover our food security, with our youth. It is important to remember our production knowledge. A person who loses their land, they lose their identity as people of the land. We need to change our daily habits. Some communities stopped growing because they don’t have land and others because they just lost the habit of doing farming. So we need to recover that part of our identity and to recover our food security. 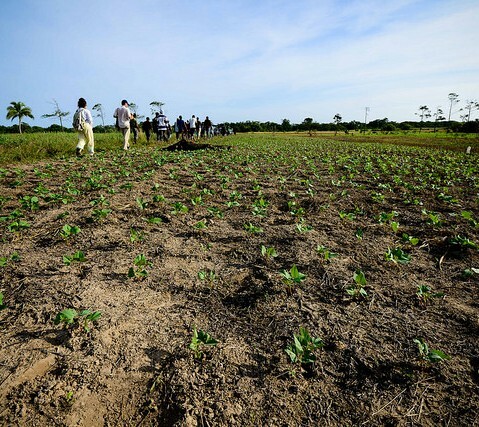 Lands in Vallecito belonging to the Garifuna have been invaded by campesinos of the area and planted in beans and other crops. There was evidence of third party financing behind their agricultural activities, including use of tractors, leading to the supposition that these campesinos are in the employ of people with interests in access to the land for Narco trafficking purposes. 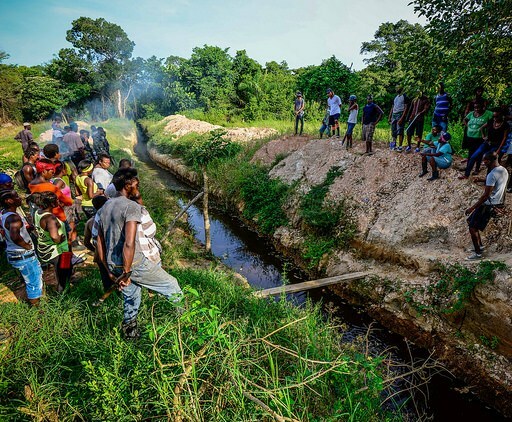 Creek dug by persons invading the Garifuna lands in Vallecito, presumably for clandestine access to the sea for drug trafficking. Heavy machinery was employed. Alfredo Lopez, a veteran leader of OFRANEH from Triunfo de la Cruz spoke of the importance of communications by means of six community radio stations run in Garifuna communities. Alfredo had been imprisoned without charges brought for more than six years starting in the late 1990s. 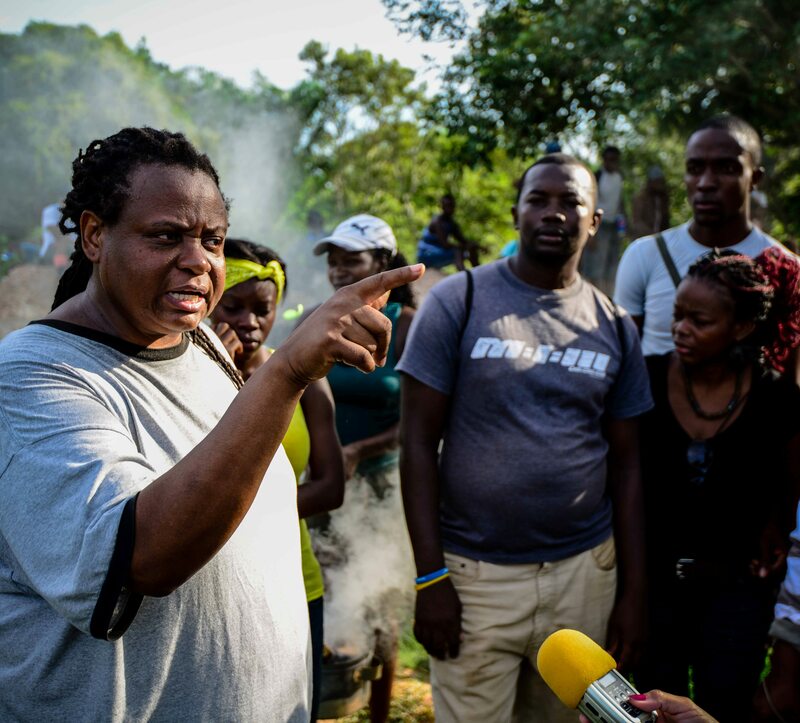 One of the first hearings and sentences issued by the Inter American Commission of Human Rights in a case relating to the Garifuna struggles helped provide sufficient pressure for his release. 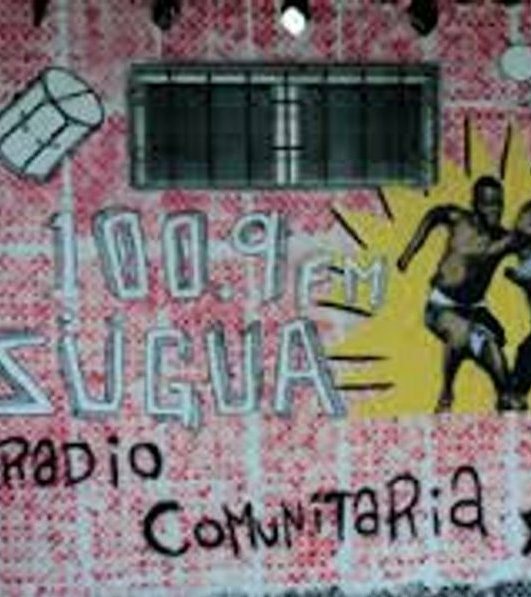 He founded the first Garifuna community radio station there: Coco Dulce Radio. Garifuna community radio aims to strengthen the use of Garifuna language, inform and educate the community on issues relating to Garifuna well being, and provide local news, music, sports and cultural programming. Garifuna community radio also trains young people to broadcast and prepare radio programming, and do community based journalism. The results of this effort in six community radio stations and in media trainings OFRANEH has organized, have been decisive in various campaigns and actions by OFRANEH in defense of Garifuna territorial integrity, as can be seen by many excellent videos and audio posted on the OFRANEH website, blog, facebook, etc… Recently CONATEL, the government ministry regulating communications, sent a letter threatening to shut down the community radio station in Sambo Creek, saying it is using a bandwidth with permission. Alfredo Lopez informed us that there is no mechanism currently in place that community radio stations could use to legalize their status. 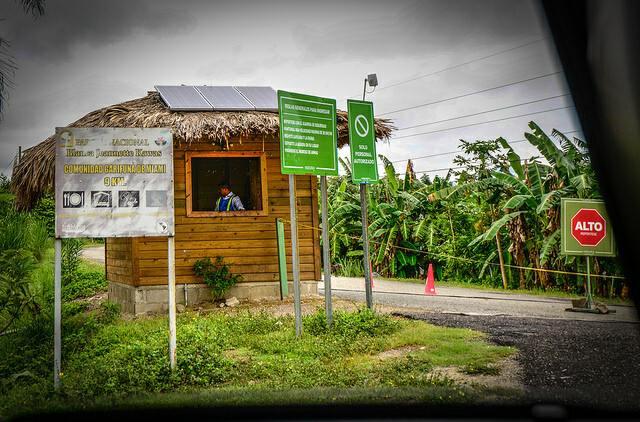 The Garifuna radio stations are currently operated under the protections of Convention 169 for indigenous peoples’ autonomy in their territories, but this Convention is constantly being violated. Alfredo Lopez sees hope in recent decisions taken by the Inter American Commission on human Rights. He described the hearing in Costa Rica as historic. 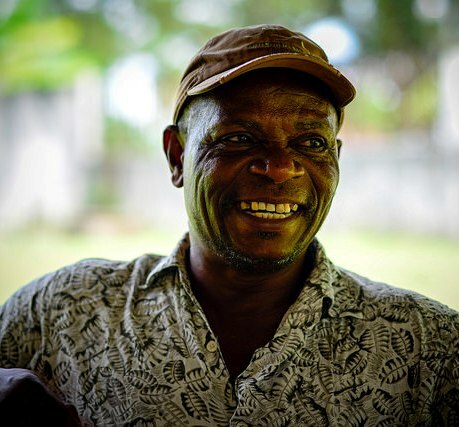 He said that the ceremony invoking the aid of the ancesters that was enacted in the hearing room by the Garifuna delegates was so powerful that when it came time for the government to testify, first their power point did not work, and then the electricity in the whole building went out, frustrating the government representatives. Soon their time elapsed before they had finished what they wanted to say and their frustration was evident. Cross examination of the government testimony displayed impatience and annoyance on the part of the judges of what the government spokesperson had said. OFRANEH expects the decision from this hearing to be issued before the end of the year. Alfredo also said that in addition to two other cases accepted but pending by the tribunal, a fifth case was accepted by the court in the record-breaking time of only four months. That case concerns Puerto Cortez, which evidence now available is showing that the entire Port there was built on what was Garifuna land, similar to the Port in Castillo. Youth Brigade member waters a pepper plant in kitchen garden/farm in Vallecito, the new center for Garifuna struggle for autonomy and self determination. Photo by Steve Pavey. Agricultural Missions delegation: Our delegation was struck by the strength and resilience of the coastal Garifuna communities we visited. The Garifuna people are blessed by fisheries and lands rich in biodiversity and fertility, which they have stewarded so well since their arrival here on this coast more than 200 years ago. 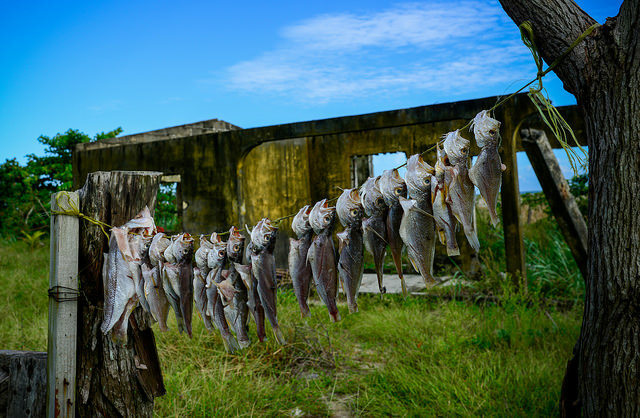 Sea fishing, freshwater fishing, gathering of crabs and shrimp, growing of cassava, bananas, plantains, wild fruits and vegetables, the preparation of delicious casaba and coconut breads. Their diet is wonderful and their subsistence economy rich and agreeable. Going back and strengthening those roots under the banner of food sovereignty is indeed a recipe for long term endurance and cultural resilience, and a basis upon which to continue to struggle for a democratic Honduras. We applaud the work of OFRANEH and the Garifuna communities they accompany and advocate for and with!! We will do what we can to stand with them in solidarity. 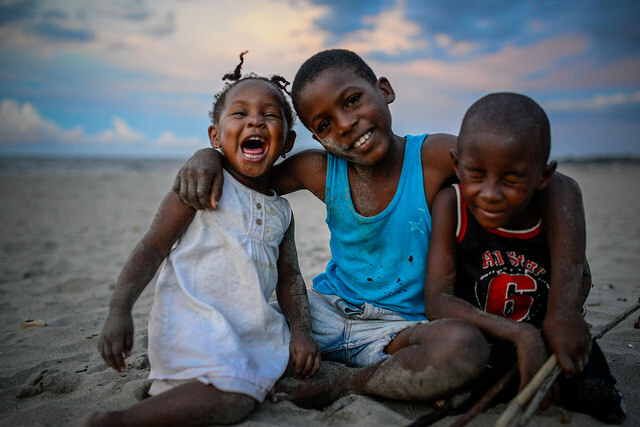 Garifuna children on beach in Triunfo de la Cruz, Tela Bay, Honduras. photo by Steve Pavey.